Thank the LORD JESUS! 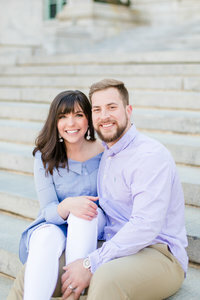 The absolutely unbearable freezing temps has past us for a while and we were able to start photographing sessions again! We were so happy that it was the perfect temperature outside for Molly & Jimmy’s downtown Annapolis maternity session yesterday! We were also super thankful that they were able to move their session time up in the day so that we could get the absolute most out of these thick cloudy skies! It was just dark all day yesterday and we knew that if we had waited for that “glow”.. well lets just say we’re glad no one held their breath because there was zero chance of a glow in the sky last night. You know where there was MAJOR glowing happening?? In Molly’s face!! She just looked so radiant and you can tell that she has been enjoying this season of her life as a new momma! Jimmy was glowing too, of course. Watching the way he smiles at Molly was just so endearing. MAJOR BABY FEVER happening over here!! Check out our favorites from yesterday.